The Cottesloe Roosters. Established 2013. The Cottesloe Amateur Football Club Inc. “Cottesloe Roosters” is one of the newest additions to amateur football in Western Australia, having been admitted to the WAAFL for the 2014 playing season. In 2015, our mighty Red Team (Reserves) made history as the first ever Cottesloe Roosters Premiers. The Cottesloe Roosters enjoyed another successful year in 2016, with the Blue Team (League) playing in the grand final elevating the Cottesloe Roosters to C3 in 2017. In their inaugural 2016 playing season, the new Roosters under 15's team (established in conjunction with Cottesloe Magpies Junior Football Club) won their grand final. In 2017, the Club will field a C3 League and C3 Reserves team in the WAAFL. The Club’s home ground is located at Cottesloe Oval on the corner of Broome and Jarrad Street, overlooking the ocean just above Cottesloe beach. We are committed to creating a family-orientated amateur football club, encouraging and supporting junior players with their transition through to playing seniors football, reintroducing former players to the game and offering the opportunity for players to return to their local area. Further, the Club aims to develop a relationship with local community and build an inviting atmosphere such that all members of the family feel welcome to come and watch the football and enjoy the Club and the people involved. Our aim is to create a sustainable club that will stand the test of time. 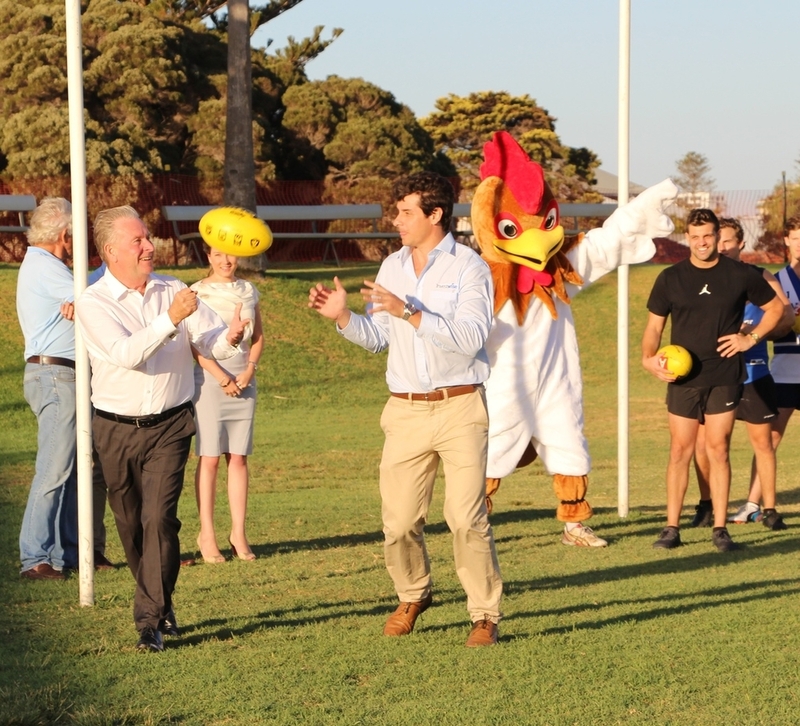 While respecting the traditions of old, the Cottesloe Roosters represent a new generation of leadership and coaching and will foster a culture of camaraderie, mateship and unity, without the politics. It’s a team that will pride itself on playing the hardest working players. The inaugural Club Patron is the Member for Cottesloe and the Premier of Western Australia, the Hon Colin Barnett MLA. Pictured: The Hon Colin Barnett MLA with former Director of Football, Andrew Embley.